(Come out) Mmm you look so fine......"
"We only have a day or two while this weather lasts, by the weekend it will be too late!" "Hang on, hang on what are you talking about? I ventured more than a little bewildered. "We have to drive to Kent tomorrow - What are you doing? I need your help". "OK OK" I replied. "What time...?" It turned out a few years previously on a trip to the garden of England my friend had come across a pretty fruit farm on a quiet lane with a sign at the gate. Venturing in he had been seduced there by names such as Colney, Penny and Kordia and on a whim been persuaded to adopt two - cherry trees that is. This is an arrangement whereby all the produce from the trees are for your exclusive use. Wonderful but there are two significant catches. 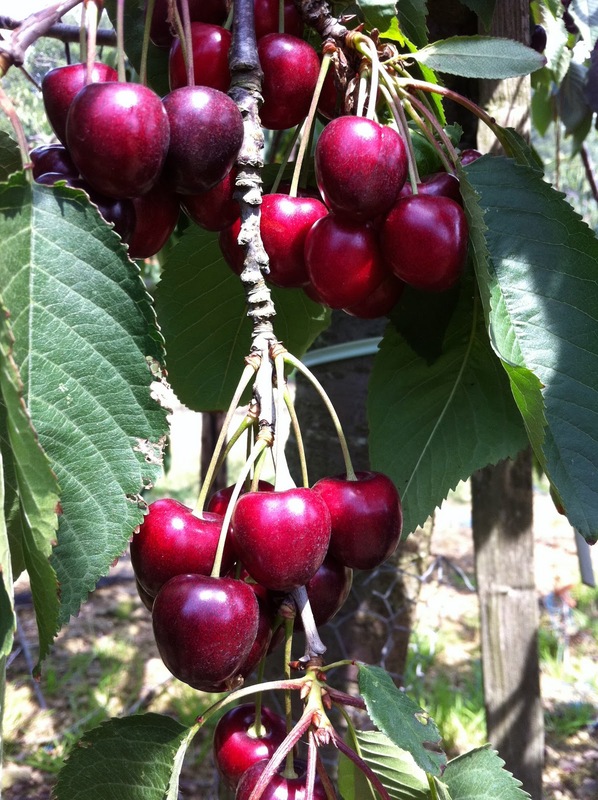 Firstly you have to harvest all the fruit yourself and the second far more complicated constraint is a product of the combination of the cherry breed and meteorological conditions to which they are very sensitive. Too little rain and the fruit won't ripen whilst conversely lots of moisture makes the cherries split through the process of osmosis, where the rain running over and down the cherry is absorbed until it can’t expand any further and the skin bursts causing the cherry to split. Left too long a burst cherry will ruin all the others. Having missed the short harvesting window the previous year our friend was anxious not to miss it again. The next morning, true to the weather forecast, was warm and sunny, we threw a picnic into the back of the car and sped off. Covered in light frame arches supporting bird nets, the cherry trees lined up neatly and were groaning under the weight of ripe red fruit dragging the branches to the ground. Here and there a tree had been striped bare as if by magic - we were obviously not the first to arrive - We were introduced to our two trees which were side by side and set to work. About the height of a tall person, no ladder was required to reclaim all the bounty, nevertheless for some mysterious reason I would say only about half of the fruit made the hazardous journey into our baskets lying on the ground!!! Back home we set about freezing them. To do this make sure they are clean and there are no bugs etc, you have to stone each one - there are many cherry stoners you can order on the internet - and lay them (not touching) on a tray in the freezer. Once solidly frozen they can be put in freezer bags for the longer term. Its all great fun and we still have a freezer drawer full of them but this year..... ? Well last summer I did notice large trays of juicy fresh Kentish cherries are available very cheaply down the road at the North End Road market during the season......!